Yes, I want to join the club “JUST FOR FRIENDS” and be informed about all REPLAY events and new initiatives! Hand over your Club Card to our staff when purchasing any Replay article and they will reward you with 1 point for every € spent. 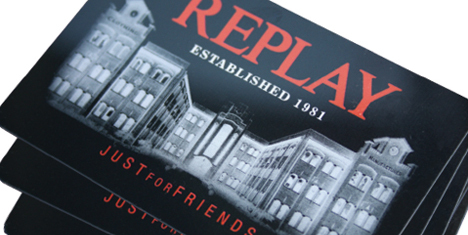 Reach 800 points and you will receive a €80 voucher to spend at any Replay store listed on www.replayjeans.com. The voucher is not divisible and must be used during a single shop for a cumulative purchase which exceeds the voucher value. Your Club Card will be activated immediately and will be valid for one year from the date of your last purchase, therefore if no purchases are made during said year your balance will be reset to zero. As a “JUSTFORFRIENDS” Club member you will have access to exclusive discounts as well as special JUSTFORFRIENDS competitions. You just need to register with us leaving your contact details and confirming your email within 30 days of our validation request, if we do not receive validation of your email account with 30 days your Club Card will be deactivated and any points will be lost. Fashion Box Spa reserves the right to amend these terms and conditions at any time.